Hi! This is Brian from This Cookin’ Dad. You know, I love winter, but with the sun rising so much later in the morning, it’s tough for me to wake up early enough to put together a nice, yummy breakfast for my early-rising kids the way I do in the summertime. My solution? Get a head start the night before, of course. 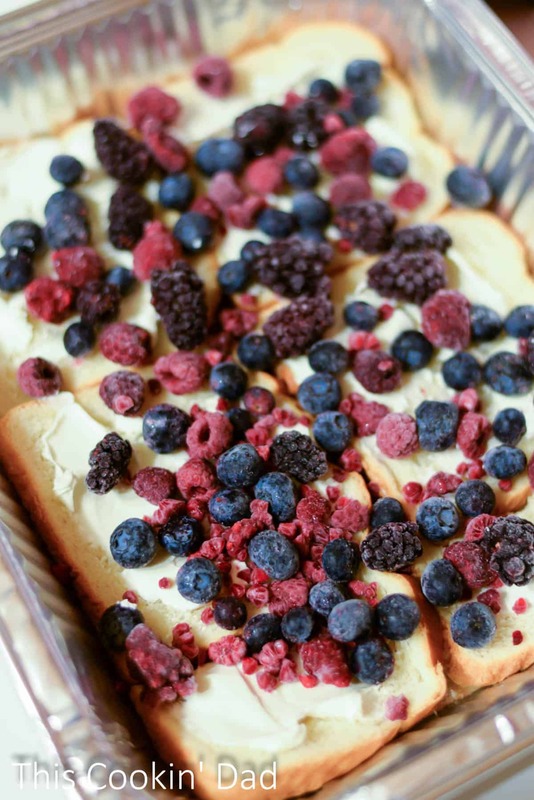 One of my kids’ all-time favorites is my Make-Ahead Berry Cream Cheese French Toast! I love, love, love French toast. It’s among my favorite breakfast options and it’s a terrific way to use up bread that has seen better days. The best way to serve French toast, in my opinion, is with a little dollop of cream cheese, some mixed berries, and a whole lot of maple syrup. My make-ahead version is easy to make, perfect for a low-stress morning, and sure to please! I add the sugar to my berries and let them sit for 30 minutes to an hour while my cream cheese softens. 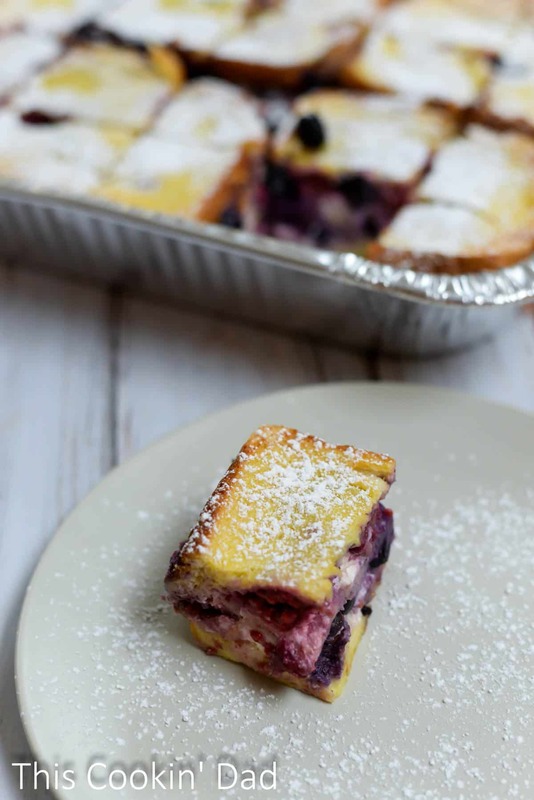 Putting it all together is as simple as can be, I smear 6 slices of bread with the softened cream cheese, place into a greased foil pan, and top with half of the mixed berries. I repeat once and top with the last of the bread. I whisk the eggs and milk together and pour over the layers of bread. Next, I cover with foil and weigh the whole thing down with cans to compress it all so that the French toast is easier to cut and serve. 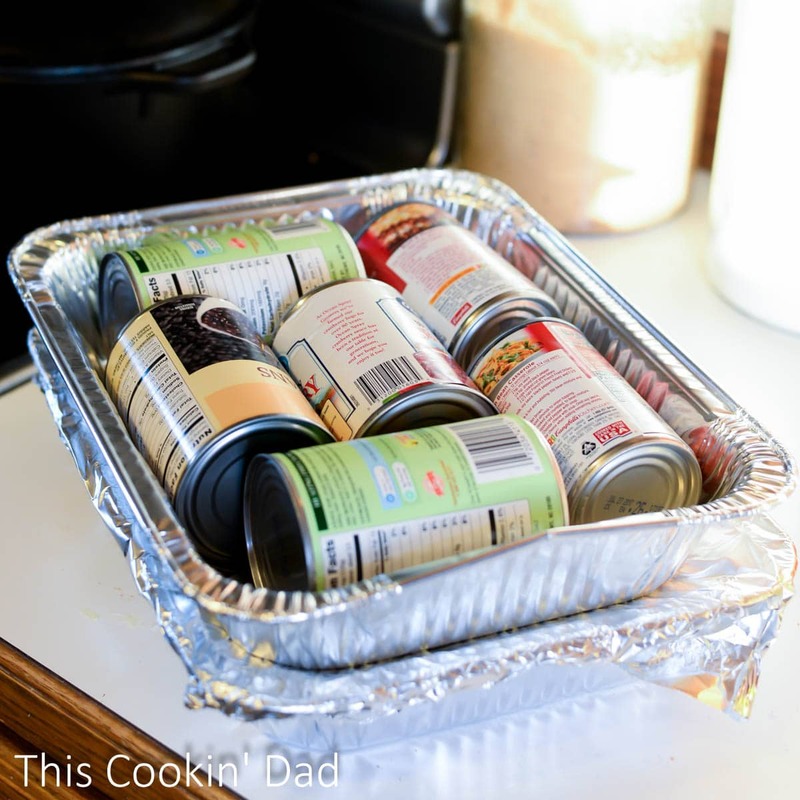 I use foil pans for several reasons. First, clean up is so much easier. Second, I don’t have to worry too much about my glass casserole dishes cracking in a hot oven! The next morning, I just set the oven to 350 and pop in the dish. It should be in the oven covered for 40-50 minutes and then uncovered for 10 or until the top is browned. It’s so easy a child can do it…and, if your kids are old enough, you should let them! Then you can sleep in a little longer!! I slice up nice, hearty servings and serve with maple syrup or just a simple dusting of powdered sugar. If the kids are lucky, maybe I’ll have some sausage patties ready to go! Add the sugar to the berries and let them sit or 30 minutes to an hour while the cream cheese softens. 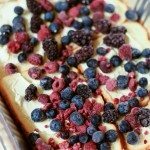 Smear 6 slices of bread with the softened cream cheese, place into a greased foil pan, and top with half of the mixed berries. Repeat once and top with the last of the bread. 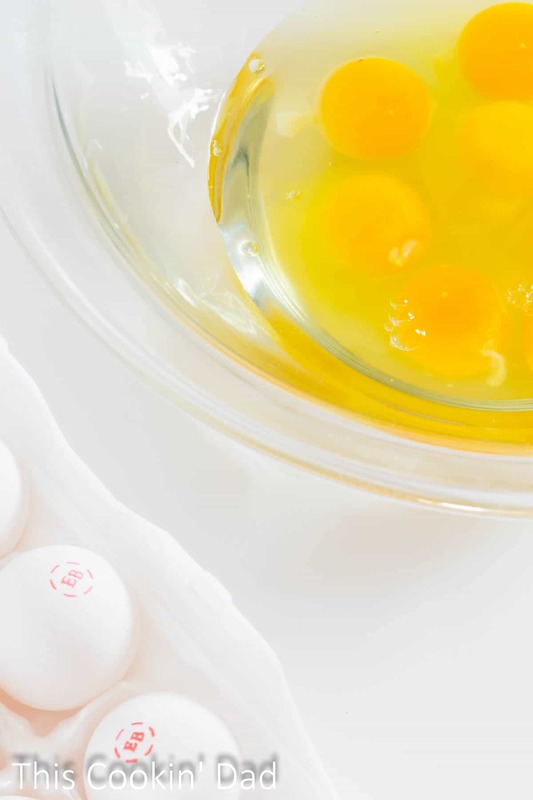 Whisk eggs and milk together and pour over the layers of bread. Next, cover with foil and weigh the whole thing down with cans to compress it so that the French toast is easier to cut and serve. The next morning, set the over to 350 and pop in the dish. It should be covered for 40-50 minutes then uncovered for 10 or until the top is browned. How do you make breakfast easier on those dark winter mornings? Leave a comment and share your story. Hi, my name is Brian and I would love for you to come visit me on This Cookin’ Dad. I’m a husband, father, veteran, and teacher and my camera and I are on a journey to find, taste, and snap food from all over and bring them back to share with my family and with yours. Make sure you follow along on Facebook, Twitter, Pinterest, and Instagram to join my adventures. I might be missing it somewhere, but how long do you cook this for? All I see is to set the oven to 350. Just discovered your blog thanks to this deliciousness! Can’t wait to make and try. Hi there! This look amazing. Two questions: how long are you supposed to bake it and can you make it all at once and not do the overnight thing? Came across this recipe and it looks yummy! Also, I also assume you refrigerate it overnight since it has raw eggs in it … right? Looks too good. Can’t wait to try it.